What is meant by Kendo? 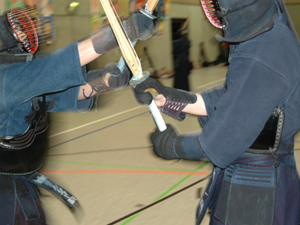 A constant training is very important with Kendo. Katana offers different training units based on the level and age per week. Opening hours of the sports hall are Tuesday and Wednesday at 17:45 and Thursday at 19:15. 1Teilnahme an der Gruppe nur nach Absprache mit dem Trainer. Die Fördergruppe ist für Kendoka gedacht, die sich schrittweise an das fortgeschrittenen Niveau anpassen möchten. No training will take place on days of closure of the Japanese school! Training free periods will always be announced under the headline news and dates.